Henry Evans (ca.1832-1905) was born in Kennington, South London. Under the stage name "Evanion" he enjoyed a long and successful career as a conjurer, ventriloquist and humorist. 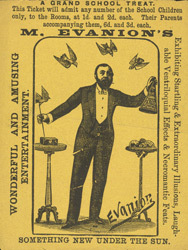 This ticket shows Evanion at the height of his success when his stage routines featured an assortment of magical effects, illusions, juggling and ventriloquism, all of which would be performed with a fine sense of wit and humour. During a typical performance "trick followed trick with wonderful rapidity, and a profusion that speaks highly for Mr. Evanion's resources", as the Morning Advertiser stated on 23 December 1873. In his heyday Evanion performed before members of the Royal Family including Queen Victoria at Sandringham, and the Prince of Wales (later Edward VII) and Princess Alexandra at Marlborough House. Throughout his career Evanion collected a variety of material relating to entertainment and everyday life, including posters, handbills, trade catalogues, tickets and advertisements. In 1895 the elderly and impoverished Henry Evans sold some 5000 items to the British Museum. Today this collection of ephemera gives us a valuable insight into Victorian daily life.